LIMA, Peru (AP) — Vice President Mike Pence told allies at an international summit in Latin America on Saturday that the US-led airstrikes on Syria ‘‘degraded and crippled’’ the country’s chemical weapons capability. The vice president, filling in for Trump at the Summit of the Americas, said the US remained ‘‘hopeful’’ that with the cooperation of Great Britain and France, and support of allies like Canada, ‘‘that we will see Syria, and their patrons in Russia and Iran, once and for all abandon the use of chemical weapons against innocent civilians.’’ Trudeau expressed solidarity with the US for the ‘‘unfortunate but necessary’’ airstrikes in Syria. 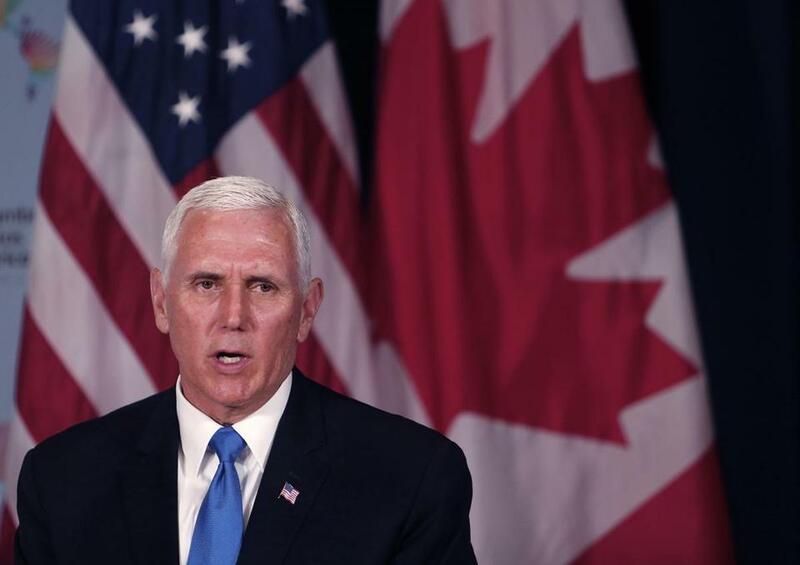 Pence pivoted to the US response to the suspected chemical weapons attack in Syria as he sought to build support for further isolating Venezuela, which has faced US sanctions amid a political crisis led by President Nicolas Maduro. Maduro has been barred from the summit over his plans to hold a presidential election that the opposition is boycotting and that many foreign governments consider a sham. But much of his focus involved relationships closer to home. Pence met with Mexican President Enrique Pena Nieto, who has yet to meet with Trump amid an impasse over the wall Trump has pledged to build along the US-Mexico border. The meeting comes amid tensions between Trump and Mexico over immigration and the president’s calls for a border wall. The two leaders did not respond to shouted questions from reporters about the border wall. The meeting with Pence was announced on Friday and follows Trump’s push to deploy National Guard troops to the US-Mexico border to fight illegal immigration and drug smuggling. Pena Nieto and opposing candidates in the Mexican presidential election have condemned the move. Pence left the summit late Friday so he could confer with US congressional leaders by telephone from his hotel suite about Trump’s plans to announce the missile strikes. Pence then attended a banquet hosted by Peruvian President Martin Vizcarra.